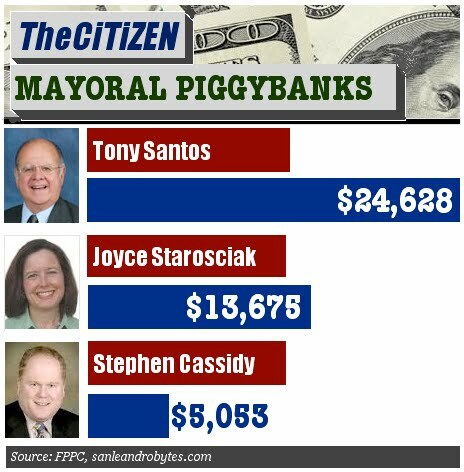 Posted in campaign finance, Joyce Starosciak, mayor, Tony Santos. Bookmark the permalink. The majority of my contributions (both total dollar amount and number of contributors) were from San Leandro residents. campaign debt, but no campaign debt was reported on this statement nor was there any record of it being paid off. Council member Starosciak's largest contribution came from a Los Angeles based political action committee with ties to Indian gaming tribes. My opponents had a substantial head start. I started raising funds only in mid November. So they had six months, I had six weeks. My campaign is a grassroots one and gaining momentum. Unlike my opponents, there is no professional political consultant shaping my communications with the community. A ten-member steering committee, all San Leandro residents, is overseeing the campaign. They have generously donated their time and labor to creating my website, literature, and hosting events. These are valuable contributions not reflected in the monetary donations listed below. In total, I raised $9,316 in monetary and nonmonetary contributions by the end of 2009.